The Easton Agricultural and Conservation Commission invite you to register for a plot at the community garden at Wheaton Farm. The gardens are located next to the Wheaton Farm parking lot on Bay Road just south of the junction with Prospect Street. Plots are available within a fenced enclosure with full sun, running water, and a storage shed. Rental for a full plot (20 ft x 20 ft) is $75 and for a 1/2 plot (10 ft x 10 ft) is $55 for the season. Reserve now to get your preferred location. After tending your crops, you can also enjoy the over 1,000 acres of protected meadows, forests, marshes and waterways at Wheaton Farm. Last year small business owners from across Massachusetts sent a strong message to Beacon Hill legislators that their concerns matter too! Join in again this year to ensure your voice as a job creator is heard. For more information, click here. The Easton Town Offices will be closed on Friday, April 19, 2019 in observance of Good Friday. The Town Offices will reopen for regular business hours on Monday, April 22nd. Are you looking to connect with other Easton folks? Do you want to try a unique dining experience? How about meeting up at a local restaurant and sharing a meal with other Eastonites? Easton’s Human Rights Committee is sponsoring Eat With Strangers on February 3-7, 2019. It’s a great way to make new friends and strengthen our community! Click here for more information and to sign up online! This forum is open to all members of the community and will be held on Tuesday, November 13, 2018 from 6:00 PM - 7:30 PM in the Oliver Ames High School Cafeteria. No sign up is required for this event. We hope to see you there! For more information, please visit the project website www.eastoneesproject.com and the attached flyer. The warrant for the Special Town Meeting is available here. The Easton Early Elementary School Project would like to invite you to join us for a Community Forum on Vision and Goals. This two hour interactive forum will be centered on the current MSBA School Building Project in Easton. This forum is open to all members of the community and will be held on October 24, 2018 from 6:30 PM until 8:30 PM in the Oliver Ames High School Cafeteria. No sign up is required for this event. We hope to see you there! For more information, please visit the project website eastoneesproject.com and the attached flyer. Click here for Official Easton Results from the State Primary Election on September 4, 2018. The Easton Board of Health has been contacted by the Massachusetts Department of Public Health and informed that a WNV (West Nile Virus) positive pool of mosquitos has been collected from Easton on 8/13/18. The species of mosquito is the Culiseta melanura. This species of mosquito is rarely attracted to mammals, and feeds almost exclusively on birds, but can affect humans if bitten by an infected mosquito. The Town of Easton’s risk level is currently at “low.” We will continue to send out updates and inform the public if the risk level changes. Please review the attached press release on ways to stay safe from mosquito-borne illness. EASTON — Chief Kevin Partridge would like to announce that a cooling center will be opened in Easton this afternoon to serve residents during the current heat wave. The cooling center will be at Frothingham Memorial Hall, 15 Barrows St., from 4-8 p.m. today. It will remain open until Friday, July 6, from 8 a.m. to 8 p.m. If additional days are needed an announcement will be made. Temperatures are expected to reach into the low 90s today and into Thursday in Easton, according to the National Weather Service. Humidity levels are also expected to be high throughout the week. Town officials will also be reaching out to the residents of Easton’s Housing Authority to provide assistance if they need it. Wear lightweight, loose-fitting, light-colored clothing. Avoid dark colors that absorb the sun’s rays. Postpone outdoor games and activities and take frequent breaks if working outdoors. Check on family, friends and neighbors who do not have air conditioning, who spend much of their time alone or who are more likely to be affected by the heat. Don’t forget to monitor your pets to ensure they are not suffering from the heat. If you do not have air conditioning, you should choose places to go to for relief from the heat during the warmest part of the day (libraries, theaters, malls, etc.). Those exposed to high heat for a prolonged amount of time can fall victim to heat exhaustion or life-threatening heat stroke. A Design Public Hearing will be held by MassDOT to discuss the proposed Corridor Improvements along Depot Street (Route 123) from Newell Circle to Washington Street (Route 138) project in Easton, MA. Please be advised that the Easton Town Offices located at 136 Elm Street will close at 10:00am for the remainder of the day on Friday, May 11th so that the Town Hall employees can participate in security training. During the week of October 21, the Water Division will be conducting its fall system flushing program to ensure the continued quality of our drinking water. The Town of Easton will hold a Rabies Clinic on Sunday, April 13, 2014. The clinic will be held behind the Police Station, at 46 Lothrop St. from 9:00 am until noon. Dr. Buffman from Lloyd Animal Medical Center will be vaccinating cats from 9:00 am to 10:00 am and dogs from 10:00 am to noon. The cost of the vaccine is $10.00. A representative from the Town Clerk’s Office will be available from 10:00 am to noon for licensing of dogs. All cats should be in a carrier, and all dogs must be leashed. Please call the Board of Health (508) 230-0620 with any quesions. Thank you. The Duck Pluck has been rescheduled!! The Water Division will be conducting its annual fall system flushing program beginning October 14th and continuing for two weeks to ensure the continued quality of our drinking water. The Water Division will be conducting its annual fall system flushing program beginning October 14th and continuing for two weeks to ensure the continued quality of our drinking water. This program will take place in the southwest section of town; however the water may become discolored in all sections of the town due to the heavy use so please check before using.�?? If you have any questions, call 508-230-0850. Town Offices will be closed today, Thursday, February 9, 2017 due to the upcoming winter storm. South Coast Rail Update: MassDOT filed a Notice of Project Change (NPC) on March 15, 2017 in order to advance the option of an interim service serving both New Bedford and Fall River using the existing Middleborough/Lakeville Commuter Rail Line while at the same time work proceeds to design, permit and fund the Stoughton Electric final phase project (including, particularly, the so-called Southern Triangle). For more information and to find out how to submit comments, click here. The Easton Historical Commission is accepting photographs through December 15, 2017 for the 18th Annual Photography Competition, Sunday January 14, 2018 from 3PM-5PM at Oakes Ames Memorial Hall. Recipients of the Chaffin Award (for an individual making a significant contribution to historic preservation in Easton), the Briggs Award (for a building or landscape project significant to Easton's historical integrity) and the Boston Post Cane (for Easton's oldest resident) will be announced at the event. Photographs should be taken in Easton and should be on the themes of historic places, historic landscapes, people, or pets. Important details about the categories and submission requirements can be found on the Town website at: http://www.easton.ma.us/boards_and_committees/historical_commission/news.php. The Recreation Department is accepting registrations for Basketball Skills Clinics, Karate, Adult line Dancing, Wrestling, Rock N Ropes, Creative Writing and Craft Workshops. The Town Administrator's Balanced Budget is now available in a comprehensive document that contains both the operating and capital budgets for Fiscal Year 2019. The budget information is presented in a helpful and user friendly format that includes a citizen’s guide to the budget, a budget summary for each department, and a glossary of common municipal finance terminology. A full copy of the Town’s Fiscal Year 2019 Budget is available here. Public Input Summit – May 2, 2018, 7:00pm. The 524 Depot Street Master Plan Team wants to know your thoughts on Easton’s recreational needs as they work on developing a master plan for the 524 Depot Street Property. The summit is being held at the Olmsted Richardson cafetorium at 7:00pm on May 2. For the 04/24/18 Unofficial Annual Town Election results, please click here. For the Unofficial Results with Write Ins please click here. Absentee Ballots for the Annual Town Election are available at the Town Clerk’s Office. Absentee Ballots are available for registered voters who will be unable to vote at the polls on Election Day due to absence from the Town during normal polling hours, physical disability preventing them from going to the polling place or religious belief. Registered voters must fill out an application which will allow them to complete an absentee ballot at the Town Clerks office or to have one mailed to them. The deadline for applying for an absentee ballot is Monday, April 23, 2018 at 12:00 Noon. Completed ballots must be received at the Town Clerks Office by the close of polls on Election Day (Tuesday, April 24, 2018 at 8PM). Get out and vote. YOUR VOTE DOES MAKE A DIFFERENCE! The Town of Easton will be holding a Rabies Clinic on Sunday April 15, 2018. The Clinic will be held at the Easton Police Station, 46 Lothrop St. from 9AM-12PM. Cats from 9:00 am to 10:00 am; Dogs from 10:00 am to Noon. All dogs must be on a leash and cats should be in carriers. The charge for the vaccine is $10.00. Please call Animal Control with any questions at (508) 230-3353. The Easton Agricultural and Conservation Commissions invite you to register for a plot at the community garden at Wheaton Farm. The last day to register to vote for the upcoming Annual Town Election is Wednesday, April 4, 2018. The Easton Town Clerk’s Office, located on the first floor of Town Hall, 136 Elm Street will be open from 8:30 AM to 8:00 PM on this day. Easton residents can check on their voter status and confirm their voting precinct from the Towns website under Town Clerk Department /Election Info/Check enrollment status. The Annual Town Election is scheduled for Tuesday, April 24, 2018. Polls will be open from 7:00 AM - 8:00 PM. All voting Precincts 1, 2, 3, 4, 5 and 6 vote at Oliver Ames High School located at 100 Lothrop Street. Easton will receive $136,376 to make pedestrian and bicycle improvements at numerous locations across town and better connect residents with the downtown area and attractions including restaurants, residential areas, parks, retail shops, and the public library. Work will include installing new crosswalk signage and markings, and bicycle racks and repair stations. On Friday, March 23, the Baker-Polito Administration’s Department of Transportation announced awards totaling $5.5 million to 23 communities through the Complete Streets Funding Program. These awards will be used to fund local, multi-modal infrastructure improvement projects, as identified in each municipality’s submitted Complete Streets Prioritization Plan. Easton’s Economic Development Council is excited to introduce a new site locator tool developed specifically to help business owners looking for a site to start or move their business. The interactive database allows property owners to list properties available for sale or lease. Business owners and entrepreneurs can then view those lists to find properties suitable for their business. The Town of Easton will be offering a seasonal flu clinic for Easton residents on Saturday January 20, 2018, from 11:00 a.m. to 2:00 p.m. at Oliver Ames High School (in the Atrium), 100 Lothrop St., Easton. Injectable vaccine is available for individuals three years of age and older. NO FLU MIST WILL BE OFFERED. The Board of Health will be collecting health insurance information (bring your cards) but shots will be given regardless of insurance status for no fee. NO APPOINTMENT NEEDED. Please call the Board of Health (508) 230-0620 with any questions. Please wear short sleeves. Due to the severe winter weather forecast, the Town Offices and Frothingham Hall will be CLOSED on Thursday, January 4, 2018. To the extent possible, please remain off the roads during the duration of the storm to allow DPW and emergency operations crews to treat and clear the snow. The Cannabis Control Commission has issued draft regulations for the implementation of the Adult Use of Marijuana Industry in Massachusetts. To view the regulations, click here. For a listing of public meetings on the promulgation of these regulations, click here. The Town of Easton will be offering a seasonal flu clinic for Easton residents on Monday, November 13, from 4:30 p.m. to 6:30 p.m. at Oliver Ames High School (in the Atrium), 100 Lothrop St., Easton. Injectable vaccine is available for individuals three years of age and older. NO FLU MIST WILL BE OFFERED. The vaccine offered is NOT preservative free and is NOT antibiotic free. The Board of Health will be collecting health insurance information (bring your cards) but shots will be given regardless of insurance status for no fee. NO APPOINTMENT NEEDED. Please call the Board of Health (508) 230-0620 with any questions. Please wear short sleeves. Today, Housing and Economic Development Secretary Jay Ash joined local officials and community leaders to award a $2.5 million MassWorks Program Infrastructure Grant to Easton for the continued revitalization of the North Easton Village, leveraging $200,000 in local funding, and building on prior efforts to attract up to $32 million in private investment. to share updates to its ADATransition Plan. To learn more about the public meeting click here. October 6, 2017 is National Manufacturing Day. A Health Promotion Clinic for residents of Easton Will Be Held on Thursday, August, 24, 2017 from 9:00 to 11:00 A.M. at the Council On Aging, Frothingham Hall, 15 Barrows Street, Easton. The clinic will provide Total Cholesterol, Blood Pressure and Diabetic (Blood Sugar) Screenings. Due to the limited number of appointments available, please call the Council On Aging at (508) 238-3160 to schedule an appointment. No Walk-Ins will be screened. The clinic is free of charge and open to any resident 20 years of age or older. For more information, and full job posting, please visit Town of Easton Employment Opportunities. Easton is working to make its streets more friendly and accessible for walkers, mobile device users and cyclists. Please help us identify hazards to pedestrians, cyclists and mobility device users. In observance of Independence Day, the Town Offices (Town Hall, Frothingham Hall, DPW and Water Division) will be closed on Tuesday, July 4th. This also means that COA shuttles will not be running that day. Town Offices will observe normal business hours the day before (Monday, July 3rd), the day after (Wednesday, July 5th), and for the remainder of the week. Have a happy and safe 4th of July celebration! The Shovel Town Cultural District is excited to present its Fourth Annual Legacy Festival. Some surprises this year with an Artist & Artisans Faire. Junior Art Show (age 18 and under) will grace the Historical Society…lots of activities for adults and children including Auntie ZaZa…fun with yarn-finger knitting; Gwyn Marathas…interactive weaving at the studio; Balloon Creations and face painting with Alleyoop Rentals; Cookie Monster Lives with Dolce Cupcakes; The Fieldhouse Arena-sports spots; planting with Flourish; Interactive Art Projects for kids with the Children’s Museum in Easton; walking tours and canoeing, of course! MassDOT Public Meeting Schedule for the 2018-2022 Capital Investment Plan. MassDOT Capital Investment Plan Public Meeting, Arnone School Cafeteria, 135 Belmont Street, Brockton - The Draft MassDOT & MBTA Capital Investment Plan (CIP) Update for fiscal years 2018–2022 is a multi-billion dollar program that makes long-term, multi-modal investments across the Commonwealth. Sign Up Now for a Community Garden Plot at Wheaton Farm! The Easton Agricultural and Conservation Commissions with the Friends of Wheaton Farm invite you to register for a plot at the community garden at Wheaton Farm. The gardens are located right off the access road to the old Wheaton Farm parking lot just south of the junction of Bay Road and Prospect Street. Raised beds are available at 20 feet by 20 feet (400 square feet) or 20 by 10 (200 square feet). Running water, fenced enclosure, and storage shed are available. Rental for a large garden is $75 and a small garden is $55. Plot rentals are going quickly. For additional information, please download the Wheaton Farm Community Gardens Registration or contact the Easton Planning Department 508.230.0630. After tending your crops, you can also enjoy the over 1,000 acres of protected meadows, forests, marshes and waterways at Wheaton Farm. The Annual Town Election is Tuesday, April 25, 2017. Polls open at 7:00 AM and close at 8:00 PM. All voting Precincts 1, 2, 3, 4, 5 and 6 vote at Oliver Ames High School located at 100 Lothrop Street. For questions please contact the Town Clerks Office at 508-230-0530. Get out and vote. YOUR VOTE DOES MAKE A DIFFERENCE!!! Saturday, April 22, 2017 from 8:00 AM to 12:00 Noon at the DPW, 130 Center Street, N. Easton. For more details, click here. The Massachusetts Department of Transportation Highway Division announced that it will be closing a section of Route 106 in West Bridgewater between Manley Street and Route 138 in Easton beginning April 3, 2017, for a period of three weeks to reconstruct the Route 106 bridge over the Hockomock River. This is to inform you in accordance with the provisions of M.G.L. Chapter 40, Section 32, that the Town’s zoning bylaw pertaining to Articles 32, 33, and 34 of the warrant for the Annual Town Meeting convened on May 16, 2016 has been APPROVED by the Attorney General’s Office on February 1, 2017. Zoning by-laws will be in effect retroactive to June 13, 2016. The public hearing pertaining to the removal of Town Administrator David Colton scheduled for Monday, February 13, 2017 at 7:00 pm has been cancelled. The Town and David Colton have reached a mutually acceptable agreement. Applications for the 73 affordable apartments at the Easton Avalon development in Five Corners will be accepted through February 2, 2017. For application forms contact Avalon at 508-219-5158 or e-mail AvalonEaston@avalonbay.com. Affordable 1-bedrooms will rent at $1,140, 2-bedrooms at $1,272, and 3-bedrooms at $1,400, utilities not included. Income qualifications and asset, use & occupancy restrictions apply. Equal Housing Opportunity. New assessed values, pending preliminary certification, for fiscal year 2017 for all Easton properties will be available through the Easton Assessors’ Office and on the town’s website from Nov. 23 through Dec. 1. To access the town’s website, go to easton.ma.us, then to Departments and Assessors, then Easton Property Values and enter the data base. Property record information, excluding the owner’s name, is listed in the data base by property address or map and lot. Values will appear on the third quarter actual tax bill due out Jan. 1, 2017. The Assessors’ Office, located at Town Hall, 136 Elm St., will be open for the public to view information, discuss values and request changes in proposed values during regular town hall hours, which are 8:30 a.m. to 7:30 p.m. Mondays, 8:30 a.m. to 4:30 p.m. Tuesday through Thursday and 8:30 a.m. to 12:30 p.m. Fridays. On average, single family homes increased 4% and condominiums increased 7%, while 2 and 3 family homes increased by 2%. The 17th Annual Preservation Awards will be held Sunday, January 22, 2017 from 3 pm to 5 pm at Oakes Ames Memorial Hall. Beginning on Sunday, October 23, MassDOT will be conducting roadway resurfacing at the intersection of Route 138 and Main Street. Hours of operation will be from 7:00 pm to 5:00 am beginning on the 23rd and are anticipated to run as such for three weeks. For questions or concerns, please contact April Letournea at 774-292-2091. CPA Eligibility Applications due November 4. The Affordable Housing Trust is holding a public meeting to discuss Easton’s draft Housing Production Plan on Tuesday October 18th from 6:30 to 8:30 PM at Frothingham Hall – 15 Barrows Street in downtown North Easton. The State requires that towns have a current Housing Production Plan to be certified as being in compliance with Massachusetts’ Comprehensive Permit Law and thus have “safe harbor” from unsolicited Chapter 40B developments. As long as Easton remains certified as being in compliance with the law, the Town has the perpetual ability to ensure future housing proposals comply with local zoning and can turn away development proposals that do not. The draft plan is available for review on the Town website. After feedback from the public meeting, the plan will be presented to the Planning Board in November and the Board of Selectmen in December and then submitted to the State for final approval in January of 2017. A COPY OF THE DRAFT PRODUCTION PLAN IS AVAILABLE HERE. We are excited to announce that all registered voters will be able to vote before Election Day for the first time ever in Massachusetts. Early voting will begin on October 24th and continue through November 4th, 2016. Prior to the enactment of this new law, the only way a registered voter was allowed to vote prior to Election Day was through absentee voting. Although absentee voting will still be available for registered voters who qualify, only those who will be absent from their city or town on Election Day, or have a disability that prevents them from going to the polls, or have a religious belief preventing the same, are legally allowed to vote by absentee ballot. CLICK HERE FOR VOTING LOCATIONS AND OTHER IMPORTANT INFORMATION. All nonessential outdoor water use is prohibited. “Nonessential outdoor water use” includes uses that are not required: a) for health or safety reasons; b) by regulation; c) for the production of food and fiber; d) for the maintenance of livestock; or e) to meet the core functions of a business (for example, irrigation by golf courses as necessary to maintain tees, greens, and limited fairway watering, or irrigation by plant nurseries as necessary to maintain stock). The Massachusetts Department of Transportation (MassDOT) and the MBTA are proposing to restore passenger rail transportation between the South Coast and Boston. MassDOT and MBTA are designing a new rail connection making use of the existing MBTA Stoughton Commuter Rail Line. Design for this route is currently 15% complete. In addition, MassDOT and MBTA are currently considering an alternative rail route between Boston and the South Coast that could potentially be designed and constructed more quickly than can the Stoughton route. CLICK HERE FOR FULL DETAILS. The Massachusetts Department of Public Health (MDPH) announced that West Nile virus (WNV) has been detected in mosquitoes collected from Easton, Massachusetts. The type of mosquito was Culex pipiens & Culex restuans. Artificial and natural containers are the preferred larval habitat for these mosquitoes. They feed mainly on birds and occasionally on mammals. They are the primary vectors of WNV. Easton has 1 WNV positive mosquito sample identified in 2016. The Town of Easton Department of Public Works is accepting applications for snow plowing contractors for the 2016 – 2017 winter season. Applications can be picked up at the Department of Public Works, 130 Center Street between the hours of 7:00 A.M. and 3:00 P.M. Applications are also available by clicking here. or call DPW 508-230-0800. The Board of Selectmen are accepting applications from interested volunteers seeking to fulfill the unexpired term of a School Committee member. If appointed, the volunteer will serve on the School Committee until the Town Election in April 2017 at which point they may run for election to the School Committee. Interested applicants must submit a volunteer form, available at the Town Offices and at www.easton.ma.us under “Volunteer Opportunities”, no later than September 19, 2016. The Town of Easton has surplus computer equipment that could not be sold on Municibid. Specifically there are 17 Gateway and HP Compaq computers that functioned well the last time they were plugged in. These computers are now released to any interested residents of Easton on a first come, first serve basis at no charge. No monitors or displays are included. These computers will be distributed in an “as is” condition with no guarantees or warranties, either expressed or implied, no benefits or agreements to service, repair, either expressed or implied for the unit and no guarantees that the unit is in current working condition. If you are interested in taking one of these computers (1 only per household please), please call Mike Deltano at 508-230-0571 on Monday, June 27, to reserve a computer and schedule a pickup time. To see a detailed list of the equipment please click here. State Representative Shaunna O'Connell will be holding office hours on Monday, June 27 from 12:00 pm to 1:00 pm at the Queset House, located at 51 Main Street, North Easton, MA 02356. Anyone wishing to meet with her may drop in or call 617-722-2305 to reserve an appointment, including appointments that need to be scheduled outside office hours. The Memorial Day Parade will take place on Monday, May 30th. The parade will meet on Church Street at 1:30 pm, before commencing at 2:00 pm at the Church Street cemetery. Parade Marshals are Cathy Folan - USMC and Jason Haven - USA and Easton's VSO. The parade will travel down Depot Street toward the Civil War Memorial, where a ceremony will take place. Have a safe and happy Memorial Day, and remember to thank the Veterans of the United States for their service and sacrifice. More information on Town Meeting and the remaining Warrant Articles can be found at this location. The Board of Selectmen are accepting applications from interested volunteers seeking to fulfill the unexpired term of a Board of Health member. If appointed, the volunteer will serve on the Board of Health until the Town Election in April 2017 at which point they may run for election to the Board of Health. Interested applicants must submit a volunteer form, available at the Town Offices and at www.easton.ma.us under “Volunteer Opportunities”, to the Selectmen's Office at 136 Elm Street, Easton, MA 02356 or via email to cread@easton.ma.us no later than May 31, 2016. South Street has been closed to through traffic at the culvert over Mulberry Brook until further notice. One of two existing stone culverts experienced a partial collapse in the shoulder of the road. Upon further investigation of the culvert it was determined that the culvert may no longer be safe for vehicular traffic. The DPW is coordinating to have the structures inspected by a structural engineer to determine if and when the structures can be returned to service. Barricades and signs have been installed to alert motorists of the situation. The Annual Town Election will take place on Tuesday, April 26, 2016 at the Oliver Ames High School on Lothrop Street. Polls will be open from 7:00 am to 8:00 pm. All registered voters are to vote at the High School. Check your voter registration status by visiting our Voting and Election Information website – http://easton.ma.us/departments/town_clerk1/election_information.php The voter registration deadline for the Town Election is Wednesday, April 6th. The Town Clerk’s Office will be open until 8:00 pm that day for registration. Absentee ballots are anticipated to arrive this week. The Town of Easton is happy to announce that the long-delayed Easton Middle School and Oliver Ames High School Solar Projects can proceed. These projects will see 0.71 MW panels installed on the roofs of both schools, generating approximately $79,000 in net metering credits in the first year and upwards of $1.24 million over the 20 year term of the agreement for the Town of Easton. Please join us this Sunday, from 9am - 12pm to help with trail work at the Clifford Grant Management Area. Complete Streets are designed to accommodate all users of Easton's roadways. To hear more about the proposed Complete Streets Policy, please join us for a public information session on Wednesday, April 13, 2016, Olmsted Richardson Cafeteria at 6:00pm - 8:00pm. For more information about Complete Streets, click here. At their April 4, 2016 meeting, the Board of Selectmen of Easton voted to place two (2) override questions on the ballot for an election on Tuesday, June 7, 2016. 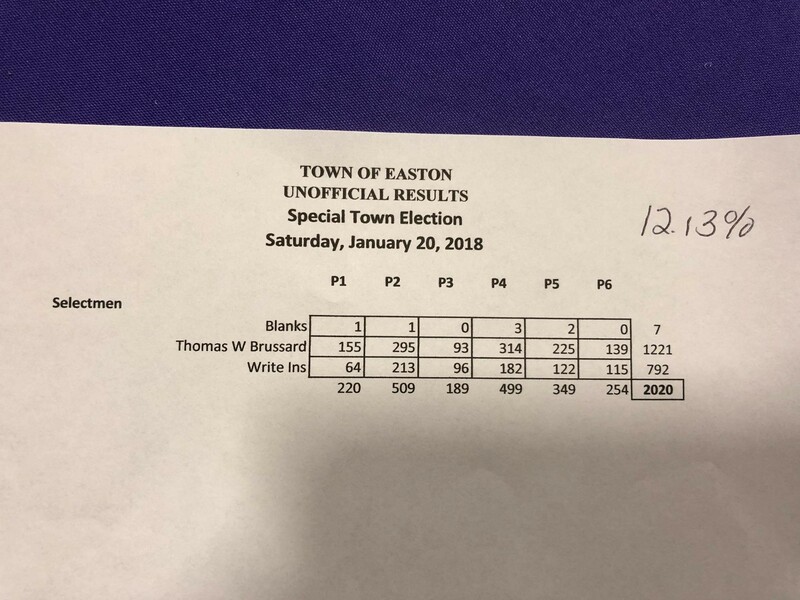 The questions are as follows: Shall the Town of Easton be allowed to exempt from the provisions of proposition two and one-half, so called, the amounts required to pay for the bond issued in order to renovate and expand the Frothingham Hall Community Center? Shall the Town of Easton be allowed to assess an additional $4,416,617 in real estate and personal property taxes for the purposes of funding the school and general government operating budgets for the fiscal year beginning July 1, 2016? To estimate the potential tax impact of the proposed operational override, use the calculator on our FY2017 budget webpage by clicking here. Due to the weather forecast, the Town Offices and Frothingham Hall will open at 12:30 PM on Monday, March 21, 2016. All evening meetings will continue as scheduled. Participants to include Habitat for Humanity, Mass Housing, Next Step Living, Housing Solutions for Southeastern Massachusetts. Easton’s Affordable Housing Trust invites the public to the Affordable Housing Fair on Thursday, April 7th. Nonprofit organizations and affordable housing developers will be on hand to provide information and answer questions. Residents can find out about affordable rentals, home ownership opportunities, energy efficiency programs, septic betterment loans, foreclosure prevention strategies, and more. The homes and programs represented at the fair are available to people at a variety of income levels. The Town of Easton is proud to announce the Fiscal Year 2017 Budget, presented in an entirely new, citizen-friendly format built from the ground up. This new budget format is more detailed than ever, while also including helpful guides and infographics to better convey important financial information to the public. The document itself is broken into seven sections that provide increasing levels of detail starting with the “big-picture” narrative all the way down to the departmental budget level. 1. No person shall sell tobacco products or permit tobacco products, as defined herein, to be sold to a person under the minimum legal sales age; or not being the individual's parent or legal guardian, give tobacco products, as defined herein, to a person under the minimum legal sales age. The minimum legal sales age in Easton is 21. The Town of Easton is proud to announce that, following a vote of the Selectmen on Monday, January 11, 2016, Town Administrator David Colton entered into an agreement with Power Management Company to procure two years of electricity for the municipality at a significant discount. With over fifty municipal facility utility accounts consuming nearly 7 million kilowatt hours (kWh) of electricity annually, the 24 month energy purchase agreement guarantees the Town a rate of 8.2 cents per kWh, which compared to the current rate through Liberty Power, will save the Town an estimated $111,423 per year. The Town of Easton is proud to announce the launch of its online Financial Transparency Center, powered by ClearGov technology. This new visual budget platform empowers residents to explore all of the Town’s revenue and expenses in more detail than ever before. Pulling data from the Massachusetts Department of Revenue as well as the Town’s financial departments, residents can see how their Town stacks up compared to state averages and track financial trends over time. In addition to providing a user friendly visual budget for the public to explore, ClearGov provides town officials with powerful benchmarking tools to analyze the Town’s performance compared to similar communities around the Commonwealth. Representative Claire Cronin wishes to invite all seniors, their loved ones and caregivers to a Community Conversation with the Chair of Joint Committee on Elder Affairs of the Massachusetts Legislature, Representative Denise C. Garlick. They will share information on the resources that the Commonwealth of Massachusetts currently uses to support our seniors. Most importantly, Representative Cronin and Chair Garlick are looking forward to listening to the issues, needs and concerns of the seniors of the community in order to plan for the future. Injectable vaccine is available for individuals three years of age and older. Due to the forecasted rain tomorrow morning, the Veterans’ Day Parade has been cancelled. There will instead be a ceremony at the VFW located at Allen Road & Rockland Street at 11:00 AM. Everyone who wants to attend should be at the post at 10:30 am. Please pass the word along. Food will still be served at the VFW after the ceremony. At its PastForward Preservation Conference this week in Washington, D.C., the National Trust for Historic Preservation presented its Driehaus Preservation Award to the Ames Shovel Works Apartments in Easton! Awards like this honor this community's commitment to protecting our historical resources and making Easton a great place to live. Click here to learn more about this award. This summer, the Town of Easton expanded its renewable energy savings by partnering with Nexamp, the largest solar provider based in Massachusetts. By purchasing net-metering credits at a discount, the Town will grow its renewable energy portfolio while reducing municipal energy expenditures. The Town is happy to announce that, as part of this partnership, Nexamp is sharing the benefits of Community Solar with Easton residents and small businesses. Now, Community Solar offers Easton families the ability to enjoy energy savings like the Town of Easton! By signing up, residents support local, clean energy, and receive a guaranteed 15% savings on their electricity bills. Flu Vaccine is available now for Easton Residents. Continue reading for time and location information. Any questions, please call the Board of Health: (508) 230-0620. The Easton Historical Commission will for the sixteenth year, announce the names of their preservation award recipients on Saturday, January 9, 2016 from 3 pm to 5 pm, at Oakes Ames Memorial Hall, North Easton (more information to follow). The Chaffin and Briggs Awards will be presented at this event. In the spring and summer of 2014, the Board of Selectmen began to review the proposed revised Town Charter, originally produced by the Special Act Charter Committee in 2009. At their meeting on June 23, 2014, the Board of Selectmen voted to re-establish the Special Act Charter Committee tasked with reviewing the proposed Town of Easton Charter from 2009. With assistance from the Collins Center for Public Management at the University of Massachusetts Boston, the Committee held numerous public meetings during 2014 and 2015 to solicit input from the public while reviewing the proposed Charter. Continue reading for meeting details. Eligibility Applications for Next Year's Community Preservation Act Funding are Now Available. Since its adoption in 2001, the Community Preservation Act has helped Easton protect numerous historic and resources and open spaces, improve our affordable housing stock and improve access to outdoor recreation. In order to be eligible for FY17 CPA funding, applicants for all potential projects must submit an Application for Eligibility by November 4, 2015. The Community Preservation Committee and staff will review each application to ensure eligibility. If the Committee agrees a proposal is eligible, a Full Application for Community Preservation Funding must then be completed. The Town of Easton Department of Public Works is accepting applications for snow plowing contractors for the 2015 – 2016 winter season. Applications can be picked up at the Department of Public Works, 130 Center Street between the hours of 7:00 A.M. and 3:00 P.M. Applications are also available on-line at this location or call DPW 508-230-0800. On September 26th from 10:00 am to 2:00 pm at the Police Department on Lothrop Street, the EPD will take part in the 10th National Prescription Drug Take-Back Program. The National Prescription Drug Take-Back addresses a vital public safety and public health issue. Many Americans are not aware that medicines that languish in home cabinets are highly susceptible to diversion, misuse, and abuse. Rates of prescription drug abuse in the U.S. are at alarming rates, as are the number of accidental poisonings and overdoses due to these drugs. Studies show that many abused prescription drugs are obtained from family and friends, including from the home medicine cabinet. In addition, many Americans do not know how to properly dispose of their unused medicine, often flushing them down the toilet or throwing them away – both potential safety and health hazards. Click here for full details. The Massachusetts Department of Public Health (MDPH) announced that West Nile virus (WNV) has been detected in mosquitoes collected from Easton, Massachusetts. Click here for more information. Wetlands - Check before you act! Wetlands - Check before you act! Activities that alter wetlands or the buffer zone associated with a wetland resource require a permit from the Conservation Commission. If you are planning a construction project, landscaping, earth removal or grading on your property, contact the Conservation Office beforehand to determine if you need a permit from the Conservation Commission. New Pond Management Area is one of Easton’s Conservation Land management areas easily accessible to most residents. However a locking chain and pole gate was installed to keep motorists from driving onto the dam. The Massachusetts Department of Public Health (MDPH) announced today that West Nile virus (WNV) has been detected in mosquitoes collected from Easton, Massachusetts. The type of mosquito was culex salinarius. It is an opportunistic biter that feeds on reptiles, birds and mammals. In 2014, 21,760 mosquitoes were tested for WNV in Bristol County and 8 samples were positive. Easton had 3 WNV positive mosquito samples identified in 2014. At approximately 7:30 pm last evening (7/28), Summer Street was reopened for public passage after emergency crews cleared the scene and it was determined by the Police and Fire Chiefs that no threat to the public existed. The Easton Assessors’ Office is in the process of doing cyclical inspections of real estate properties throughout the town, as well as inspections for building permits and new sales. The inspections will be done during the next few months with inspectors going door-to-door throughout neighborhoods to do inspections of both the interior and exterior of properties. As part of the Town of Easton’s ongoing pavement management program, the paving of Short Street will take place on Friday July 17th. Paving on Center Street and portions of Main Street is scheduled to begin Monday July 20th and continue through the week. Motorists should expect delays and seek alternate routes during this time. Police Details will be on scene to assist and direct traffic through and around the work zones. As part of the Town of Easton’s ongoing pavement management program, the reconstruction/paving of Lothrop Street will begin Tuesday June 30, 2015. During the construction the road may be closed to thru traffic, however local traffic will be allowed to pass but may encounter minor delays. Police Details will be on scene to assist and direct traffic through and around the work zone. As part of the Town of Easton’s ongoing pavement management program, the repaving of Foundry Street, between Five Corners and Eastman Street, will begin on the night of Thursday June 25th. Due to the high volume of traffic and limited roadway width this work will be performed at night between the hours of 7:00 PM and 5:00 AM. Motorists should expect delays and seek alternate routes during this time. Police Details will be on scene to assist and direct traffic through and around the work zones. Sign up today for the Easton Recreation Department 2015 Full-Day Summer Program. This program is for children ages 6-13 (14-15 for the Workreation Program). The Program is held at the Easton Middle School from 9:00AM to 3:00PM. There are 6 one-week sessions from July 6th to August 14th that include fun filled activities throughout the day. Each session includes one field trip and a day of swimming, sports, arts and crafts and much more! Field trips include, the "Minions" movie, tour of Fenway Park, Funway, bowling at Kings, New England Aquarium and United Skates. Please register soon before it fills up. If you wait it may be too late for your child to take part in some summer fun! If you have any questions please call 508-238-3084. For more information on other programs or to sign up online please visit www.easton.ma.us under recreation. Representative Claire D. Cronin (D-Easton) will be holding office hours in Easton on Monday, June 15, 2015. Walk-ins are welcome, but appointments are recommended. Constituents are welcome to come and voice their concerns, share their views, or discuss any constituent service matter with Representative Cronin. As part of the Town of Easton’s ongoing pavement management program, the repaving of Center Street, Short Street, and portions of Main Street will begin the week of June 8th. The portions of Main Street will include the section from Barrows Street to Canton Street and the area immediately adjacent to Washington Street. Motorists should expect delays and seek alternate routes during this time. Police Details will be on scene to assist and direct traffic through and around the work zones. The Board of Selectmen will be accepting applications from interested volunteers seeking to fulfill the unexpired term of a Finance Committee member. If appointed, the volunteer will serve on the Finance Committee until the Town Election in April 2016 at which point they may run for election to the Finance Committee. Interested applicants must submit a volunteer form, available here, to the Selectmen's Office at 136 Elm Street by Monday, June 22nd or via email to cread@easton.ma.us. As part of the Town of Easton’s ongoing pavement management program, the reconstruction/paving of Norton Avenue will begin Monday June 1, 2015. During the construction the road may be closed to thru traffic, however local traffic will be allowed to pass but may encounter minor delays. Police Details will be on scene to assist and direct traffic through and around the work zone. 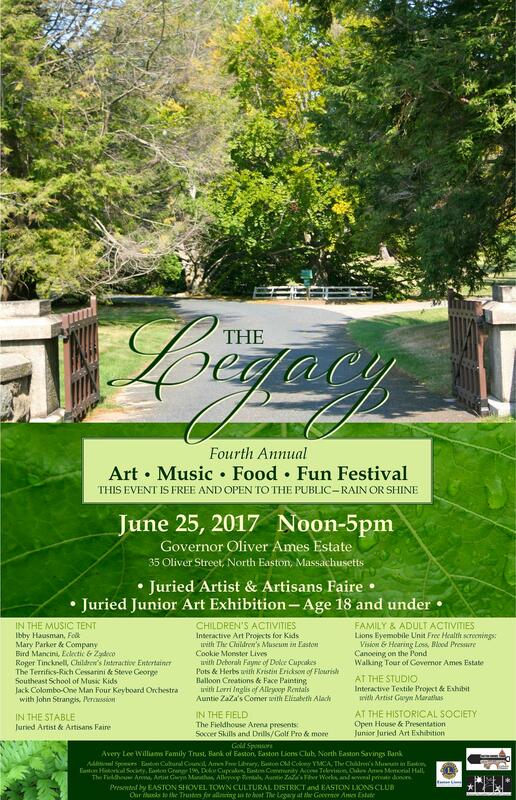 The Easton Shovel Town Cultural District and the Trustees of the Reservations wish to announce the Second Annual Legacy Art/Music/Food/Fun Festival which will take place at the Governor Oliver Ames Estate, 35 Oliver Street, North Easton MA, on June 28, 2015, from 11:00 a.m. to 4:00 p.m. Click here for more information. The 2014 Annual Town Report is now available online and in the Town Offices. To access the report online, please click here. Hard copies of the report are available in the Town Offices lobby. As part of the Town of Easton’s ongoing pavement management program, the repaving of Foundry Street, between Five Corners and Eastman Street, will begin on the night of Wednesday May 20th. As part of the Town of Easton’s ongoing pavement management program, the paving contractor will be making warranty repairs on Foundry Street between Five Corners and the West Bridgewater town line beginning on Wednesday May 20th. Senator Brian A. Joyce is pleased to announce that he will hold office hours in Easton on Wednesday May 6th from 10:30 a.m. to 11:30 a.m. in the Collen A. Corona Board Room, 1st floor, at the Town Hall, 136 Elm Street. “I encourage all interested constituents to attend my district office hours,” said Senator Joyce. As always, individuals with questions or concerns are encouraged to call Senator Joyce’s State House office at (617) 722-1643. The Senator can also be reached by email at Brian.A.Joyce@masenate.gov. As part of the Town of Easton's ongoing transition from paper permitting to fully online permitting, the Board of Selectmen's Office is pleased to announce that applicants seeking One Day All Alcohol, One Day Beer and Wine, and Road Race Permits can apply, pay, review, and receive these permits online. For instructions on how to register and apply for One Day Alcohol Licenses, click here. For Road Race Permits, click here. Want to stay up-to-date with board and committee meeting agendas and minutes? What about new documents and forms being uploaded by Town departments? The Town of Easton is happy to announce that our long-running Minutes on Demand page which hosts all of the Town’s minutes, agendas, documents and forms, has been improved to include an “Email Notification” feature. Simply visit http://eastontownma.minutesondemand.com/ and click “Email Notification” to sign up. The Town of Easton Rabies Clinic will be held Sunday April, 12, 2015 at The Easton Police Station,46 Lothrop St. N. Easton. The clinic will be held from 9am to 12 noon. The vaccines will be given by Dr. Ronald Buffman from Lloyd’s Animal Medical Center. Cats will be vaccinated between 9am and 10am, dogs from 10am to noon. The cost for the Rabies Vaccine is $10.00. A representative from The Town Clerk’s office will be available for licensing between 10 am and noon. All dogs must be leashed and all cats should be in carriers or leashed. The Recreation Department invites you to hop over to the Town Offices 136 Elm Street, Sunday April 12th, for this exciting event. Don’t forget to bring your basket for carrying eggs and wear your boots! There will be separate sections for different age groups and a special visit from the bunny. The hunt begins at 11am sharp! In case of inclement weather, the rain date is Saturday April 18th. Please call the cancellation line at 508-238-3084 for rescheduling information. The cost is $3 per child. No advanced registration required. Motor Vehicle Excise Bills for 2015 were mailed on February 9th 2015. They are DUE MARCH 11th 2015. If you have NOT received your bill ( possibly due to the snow storms) please call the Collectors office at 508-230-0610. If an excise bill has been issued in your name, you are responsible for payment by the due date whether or not your received the bill. New: Mark Your Hydrant "Shoveled"
The recent prolonged cold weather and repeated snowstorms have contributed to severe roof load conditions. Compounding the situation is the short-term weather forecast of potentially two more snowstorms over the next few days. Click here for the full public safety advisory on potential roof collapses. Click here to visit the Mass. Department of Public Safety webpage. Update from Waste Management: Due to the forecasted storm, Waste Management has canceled pickup for Monday, February 2, 2015. Waste Management does not want to further delay the Tuesday pickup canceled due to last week's storm, so Tuesday and the rest of the week will remain on schedule. Monday will be canceled for the week of 2/2 and will pickup on Monday 2/9 with double allowance. The canceled Tuesday pickup from last week (1/27) will be picked up on Tuesday, February 3rd. Representative Claire D. Cronin (D-Easton) will be holding office hours in Easton on Tuesday, February 3, 2015. Walk-ins are welcome, but appointments are recommended. Constituents are welcome to come and discuss any constituent service matter with Representative Cronin. Easton has changed our online bill pay vendor to City Hall Systems. If you wish to pay your Real Estate and Personal Property bills online, please click here.If you have previously registered for E-Billing or auto payments - you will need to register once again on this new site, we apologize for the inconvenience. The Easton Board of Health is pleased to announce that a Seasonal Flu Clinic will be held for Easton residents Wednesday December 3rd from 4:30 PM to 6:30 PM in the Atrium at Oliver Ames High School, 100 Lothrop Street, North Easton, MA 02356. Vaccine will be available for individuals three years of age and older. Contact the Board of Health at 508-230-0620 with any questions. Easton’s annual Veterans Day Parade is scheduled for Tuesday, November 11th. Groups are asked to form at Washington Plaza no later than 10:30 am as the parade will kick off exactly at 11:00 am. The parade route will be marching from Washington Plaza up Main Street to the World War I Memorial, where there will be a ceremony. After this ceremony the parade will reform and continue to Veterans Memorial Park and the World War II, Korean and Vietnam Memorial where there will be another ceremony. This is also where the parade will end. As you may be aware, effective November 1st, National Grid electric rates are set to increase by up to 37%. This increase in price is driven by an increasing reliance on natural gas for electricity generation and an increase in demand for natural gas region wide. In order to mitigate the increasing cost in energy, consider visiting www.masssave.com for information on energy efficiency rebates and other cost-savings measures. As part of the Town of Easton’s ongoing pavement management program, the resurfacing of Foundry Street has been rescheduled to take place during the week of October 27, 2014. The work will take place on Foundry Street (Route 106) between Five Corners and the West Bridgewater town line. Motorists should expect delays and seek alternate routes during this time. Police Details will be on scene to assist and direct traffic through and around the work zones. The Easton Community Preservation Act Committee (CPC) invites interested parties to apply for the next round of Community Preservation Act (CPA) funding. Projects eligible for funding address one or more of the following goals: Open space preservation (conservation or recreation); historic preservation; community housing. All potential projects must first apply to the Community Preservation Committee and projects supported by the CPC are then sent to Town Meeting in May. The CPC expects FY16 available funding to be extremely limited and not all potential projects are likely to be funded. The Town of Easton, Massachusetts is disposing of surplus vehicles and equipment via an internet website. Visit www.municibid.com to view and bid on surplus items until 3:00 p.m. on Thursday, November 13, 2014. At that time the opportunity for bidding on these items will close. All residents are invited to participate in a series of community design workshops during the month of November to help envision how the Rockery, at the intersection of Main, Barrows and Lincoln Streets, can be better used and appreciated, and how the surrounding Main Street area could be improved and better connected. The project kickoff meeting will take place on Wednesday, November 5, 2014 at 6:30 PM at Oakes Ames Memorial Hall. Please RSVP to the planning department at 508-230-0630 or at ganderson@easton.ma.us For more information, please click here. The Water Division will be conducting its annual fall system flushing program beginning October 14th and continuing for two weeks to ensure the continued quality of our drinking water. This program will take place in the southwest section of town; however the water may become discolored in all sections of the town due to the heavy use so please check before using. If you have any questions, call 508-230-0850. The Inspectional Services Department is now using an online permitting program. Contractors, electricians, plumbers, and gas fitters who are submitting permit applications - and homeowners who are applying for a building permit - can now submit applications online. The whole process is automated and paperless. The first step is to register and set up an account. This will take less than five minutes and will save time when submitting a permit application. Please click here. Please note that payment for permits will be made online with a check routing number and account number or Master Card or Discover Card (additional fee). In recognition of Domestic Violence Awareness Month,Bristol County District Attorney Sam Sutter announced today that he is partnering with the 20 police departments across the county, including the Easton Police Department, as well as Verizon Wireless' HopeLine Program, which collects unused wireless phones and parts to support survivors of domestic violence. The Master Plan Steering Committee is pleased to release a full draft of Envision Easton, a roadmap for the future of the town. Envision Easton is the culmination of many months of cooperative effort, overseen by the Master Planning Steering Committee, to develop a Comprehensive Master Plan that will guide the way Easton develops into the future. As a way to help our residents protect themselves from identity theft and fraud, the Easton Town Clerk’s Office is holding its 2nd Annual Shred-It Day on Saturday 9/27/2014 from 9 am to 12 Noon. A professional document shredding company will be on location at Town Hall, 136 Elm Street. All residents are encouraged to bring their items to be destroyed, at no charge! Volunteers needed - Clifford Grant Trail Work - Sunday, September 28, 2014, 9AM to 1:30PM, Oliver Ames High School parking area, adjacent to Clifford Grant Trails. Representative Claire D. Cronin (D-Easton) will be holding office hours in Easton on Monday, September 8, 2014. Walk-ins are welcome, but appointments are recommended. Constituents are welcome to come and discuss any constituent service matter with Representative Cronin. Do you have spots on your tomatoes? Wondering what you can plant now that will grow in the fall? Come to the Garden Clinic at the Wheaton Community Garden on Thursday, Aug. 21st! As part of the Main Street Revitalization Project, construction of the Mechanic Street parking lot will begin the week of July 14, 2014. Construction is expected to take approximately 2 months. During this time parking in the lot will be restricted and/or reduced. There will also be some minor work on Main Street, primarily in the sidewalk area, for utility work related to the undergrounding of certain overhead utility lines. Mandatory outside water restrictions are in place from May 1st to September 30th. This action is necessary to comply with the Town's Water Management Act Permit. For more information, please click here. As part of the Main Street paving project, the installation of the top course of asphalt is scheduled to take place on Tuesday June 17th (weather permitting). Please be advised that the Town of Easton is working together with the firm KRT Appraisal to perform re-cyclical inspections on residential properties within the town. The streets that will be inspected over the next few weeks will be: Turnpike, Central, Summer and Center. As part of the Town of Easton’s ongoing pavement management program, the reconstruction/paving of Canton Street will begin the week of May 27, 2014. During the construction the road may be closed to thru traffic, however local traffic will be allowed to pass but may encounter minor delays. Police Details will be on scene to assist and direct traffic through and around the work zone. Join the Town of Easton, the Massachusetts Department of Energy Resources (MA DOER), Borrego Solar, and partners,in celebrating the completion of a 1.9 Megawatt ground-mounted solar landfill installation in Easton; a Massachusetts Department of Energy Resources Green Community Designate. The Water Division will be holding their 31st Annual Household Hazardous Waste Collection Day on Saturday, April 26, 2014 at the DPW, 130 Center Street. The event will begin at 8:00 a.m. and end at 12:00 Noon. The Recreation Department is accepting field requests. Facility permit applications are available at this location. Please submit completed paperwork by March 31, 2014. Any questions please call the recreation office at 508-238-3084. The Agricultural Commission is accepting applications for plots at the Wheaton Farm Community Garden. Full size (20' x 20') and half size (20' x 10') plots are available. Submit your application early as plots are available on a first come first serve basis. Click here for the application. Want to have a say in what Easton looks like well into the future? Let us know your thoughts on important topics like how and where Easton should grow; what aspects of Easton should be protected from development; and how neighborhood character can be enhanced or protected. Provide your feedback on the big issues Easton faces as a community, goals and objectives being developed in conjunction with Envision Easton, Easton’s ongoing Comprehensive Master Plan. Click here to go to the Envision Easton Feedback Loops to provide your comments and feedback. Representative Claire D. Cronin (D-Easton) will be holding office hours in Easton on February 11, 2014. Walk-ins are welcome, but appointments are recommended. Constituents are welcome to come and discuss any constituent service matter with Representative Cronin. The Easton Board of Health is pleased to announce that a Seasonal Flu Clinic will be held for Easton residents Saturday January 11th from 10:00 AM to 12:00 PM in the Atrium at Oliver Ames High School, 100 Lothrop Street, North Easton, MA 02356. Vaccine will be available for individuals three years of age and older. For more information, please contact the Board of Health at (508) 230-0620. Waste Management Customers: Please be advised that due to the storm Waste Management has now cancelled pickups for today, Friday January 3rd. Pickups originally scheduled for today will be collected on Saturday January 4th. Collections originally scheduled for Saturday January 4th will now be collected on Monday January 6th. All collections for the week of January 6th will be delayed by one day. If you have any questions please contact the DPW at (508) 230-0800.